STOCKTON, CA - In a tough road environment and trailing by four heading into the ninth, Visalia once again called up some late-inning magic to bring the game within reach. Leading 8-4 and coming out for a second inning of work, Trey Cochran-Gill walked Jasrado Chisholm and gave up a single to Drew Ellis to bring the tying run into the on deck circle. Rick Magnante wasted no time in going to his closer Angel Duno to quiet the Visalia rally with the meat of the order coming up. But sometimes the game doesn't go according to the normal script in the playoffs. Duno got Daulton Varhso to line out, but then fell into trouble. Duno walked Marcus Wilson, loading the bases for Pavin Smith. Visalia was hitless with runners in scoring position entering the inning, having twice left the bases loaded in the game. But this time, Smith came through with a single to center, bringing the Rawhide to within two in an 8-6 game. Ramon Hernandez followed by flaring a single to right, plating Wilson and inching Visalia closer. Smith pulled up at second as the tying run; the Rawhide were rallying. And Magnante once again went to the bullpen, this time opting for the sidewinder Sam Sheehan. Sheehan's first hitter was Renae Martinez, who fell behind with two strikes but punched a grounder past the dive of third baseman Edwin Diaz into left. Smith was waved around third and Luke Persico delivered a two-hop strike to home plate, gunning down Smith and keeping the Ports on top. Sheehan (SV, 1) fell behind Anfernee Grier but got him to ground out to third and end the game. Visalia (1-1) trailed by as many as five runs after the third and trailed by at least four runs twice. They had the tying run in scoring position four times and, despite struggling early, brought the nearly four-hour game to a dramatic head in the ninth. Stockton (1-1) struck early against Visalia starter Jeff Bain (L, 0-1) who, one start removed from tossing six no-hit innings against Stockton in August, was tagged for five runs over three innings, allowing nine hits and striking out three. Ports starter Wyatt Marks did not last long either, completing four innings and letting two runners reach in the fifth before he was lifted. The Rawhide used six different pitchers and Stockton went through seven. Jake Bray (W, 1-0) worked 1.1 innings, stranding the bases loaded and putting an end to a two-run Rawhide rally in the fifth, where both runs scored on bases-loaded walks. Wilson homered for the second straight game to get the Rawhide on the board in the fourth and drew three walks, including a run-scoring free pass with the bases loaded in the fifth. 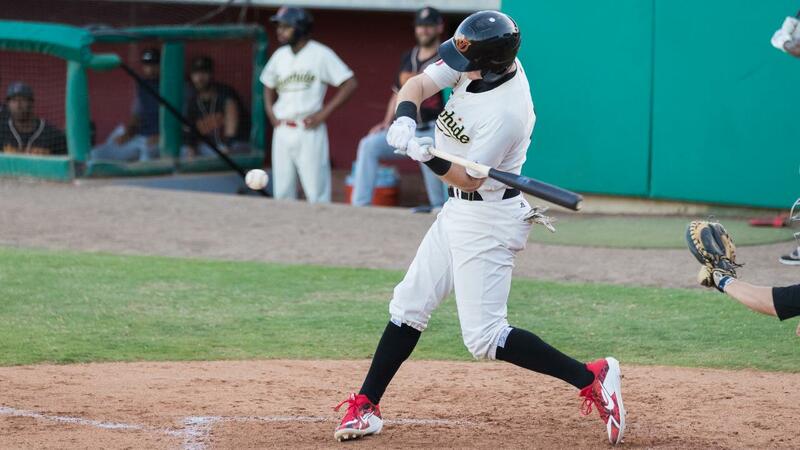 Smith led the way for the Rawhide offense with three hits and drove in a pair. Renae Martinez added a pair of hits and scored once. The Ports have five different hitters put up multi-hit games and three different players drove in two runs. Chase Calabuig hit his first career home run in the fourth. The best-of-five North Division Championship Series goes to Visalia tomorrow night for Game Three, matching up RHP Connor Grey (10-9, 4.54) against Ports RHP Kyle Friedrichs (2-2, 3.27). First pitch is at 7:05 PM and tickets are available on rawhidebaseball.com.